The problem of historical contamination remains an important gap in European policymaking on soils. 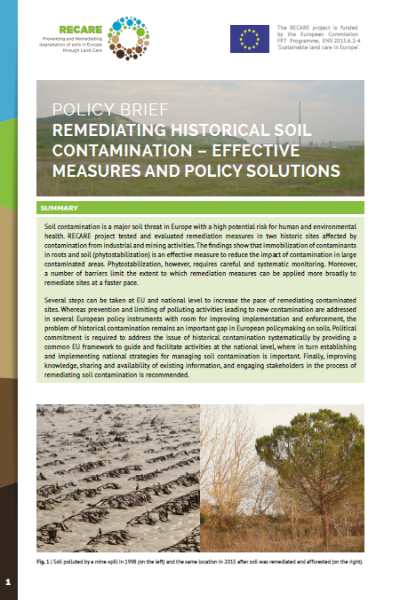 Political commitment is required to address the issue of historical contamination systematically by providing a common EU framework to guide and facilitate activities at the national level, where in turn establishing and implementing national strategies for managing soil contamination is important. Finally, improving knowledge, sharing, and availability of existing information, and engaging stakeholders in the process of remediating soil contamination is recommended by the authors, lead by Ana Frelih-Larsen and Sophie Ittner of Ecologic Institute. The RECARE policy brief is available for download. Soil contamination is a major soil threat in Europe with a high potential risk for human and environmental health. RECARE project tested and evaluated remediation measures in two historic sites affected by contamination from industrial and mining activities. The findings show that immobilization of contaminants in roots and soil (phytostabilization) is an effective measure to reduce the impact of contamination in large contaminated areas. Phytostabilization, however, requires careful and systematic monitoring. Moreover, a number of barriers limit the extent to which remediation measures can be applied more broadly to remediate sites at a faster pace. Several steps can be taken at EU and national level to increase the pace of remediating contaminated sites. Prevention and limiting of polluting activities leading to new contamination are addressed in several European policy instruments with room for improving implementation and enforcement. Frelih-Larsen, Ana et. al. 2018: Remediating Historical Soil Contamination: Effective Measures and Policy Solutions. RECARE Policy Brief. Ecologic Institute: Berlin.